Cavite is the site of Law & Gospel congregation’s first-ever teaching station outside its base in Novaliches, a suburb in the metropolitan Manila area. The work in this area started in September 2018, when a couple who are members of a WELS congregation in Appleton, Wis., reached out to me, asking if I would consider doing mission work in the said area. Our contacts in Cavite, a family of five, are relatives of the couple (specifically of the wife who is a Filipina). For more than a year now, my wife and I would travel a total of about 5 hours, back and forth, every Saturday to teach Bible study and a kid’s Bible class. Not an easy one, though, as we have to contend with the infamous Manila traffic. By God’s grace, our contacts–a couple and their two teenage children–have already finished studying Luther’s Small Catechism. There are a lot more lost souls in the community that we need to reach. As each lost soul is valuable to God, traveling long hours to Cavite every Saturday is definitely worth it. To learn more about world mission work in the Philippines, visit wels.net/philippines. Come along with me. . .
Malawi 2015 revisited. What happened? A deluge of rain: rivers overflowed, Maize fields flattened, Bridges demolished, Roads cratered. Different year, different people, different location, same result: devastation. Rains are a double-edged sword. Just enough and wells fill, fields drink, crops grow and the land produces.Too much and houses collapse leaving them useless; pit latrines overflow rendering them a danger. It all happened in Malawi. People are reminiscing that this same thing happened just four years ago. The Malawi 2018/2019 wet season had a great start. A great balance of rain and sunshine. Crops were looking good. Tobacco. Maize. Groundnuts. Farmers were ecstatic! It’s going to be a bountiful harvest! We can sell our cash crops, our granaries will be full, we will harvest plenty to eat good, our bellies satisfied. . . no hunger this year! Then came the March 6, 2019. Ash Wednesday arrived, and so did another rain. Well, not just another rain, but a downpour. The heavens opened. Water fell by the bucket. Cats and Dogs. Didn’t let up for 3 solid days. This time the land and the areas most affected are quite flat so the water didn’t have a natural run off. When rains fall that rapidly and that powerfully, mud houses just don’t stand a chance against such force and pressure of water. The torrent was enough to bring down the roof. Many houses were destroyed. Families are displaced. Women and children are sleeping in church buildings. Husbands and fathers are staying in any manageable place that they can find in what is left of their houses. A makeshift shelter. A tiny covered corner of a room. Some are sleeping under the stars. All who are affected are trying to pick up the proverbial pieces. And lurking right around the corner? Disease. It’s what happens when outhouses collapse and the holes brim over. It’s a stream you don’t want to be near. But there is a stream you do. A river actually. A river of living water. “Who or what can separate us from the love of Christ?” We know what is written in Romans 8:35. A bunch more questions that answer that first one. (If you’re not sure, check it out). But what about the questions on the minds of the homeless people in Malawi who are wondering how they are going to start over and rebuild? What can separate them from God’s love? Rains? Floods? Unusable toilets? Obliterated fields? Collapsed houses? Lost property? Can these things remove God from their world of broken walls and caved-in roofs? Paul, what do you mean, “NO”? Tell us more! Ah, yes. Good words, Paul. The people need to hear those words. So do I. . . when things in my own life collapse! You, too? For three days we surveyed the destruction and assessed the damage. So much rain, so much ruin. With such incalculable devastation I could only imagine incredible loss. What I didn’t imagine–or even think about–was the incredible gain. As the people shared their stories, I noticed that they had gained something: a new appreciation for the goodness of the Lord. A renewed indebtedness to the grace of God. Gratitude for something bigger than earthly comfort. Heavenly blessings! When we arrived, they not only spoke of the rains that came down from heaven but of the promises of God that do, too! They shared with us how God spared them, protected them and saved them. We paused here for a prayer. Sat there for a devotion. Spent time with the families in meditation and thankfulness. We were invited to so many places we didn’t have time for everyone. We brought our phone cameras, but took more than pictures and videos. After seeing one collapsed house after another, what falls like rain upon my heart are the words of Moses: “Lord, you have been our dwelling place throughout all generations. . . from everlasting to everlasting you are God.” (Psalm 90:1,2) Like Paul said, “. . . we have a building from God, an eternal house in heaven, not built by human hands.” (2 Corinthians 5:1) His is a house that will never fall. The roof won’t leak and the walls won’t collapse. The foundation is strong and the rooms are safe. Meanwhile, here on earth, whether in Malawi or the USA or somewhere in-between, we groan and are burdened. All creation, too. Apparently, that includes the rains. And the mud from which many houses are built. But we look forward to a time when all those in Christ Jesus we will be safe and secure in . . . The Lutheran Church of Central Africa–Malawi Synod (LCCA), the WELS Board for World Missions, and WELS Christian Aid and Relief (CAR) have been working hard at evaluating the immediate needs of those in our Lutheran congregations who are greatly affected by the floods, especially in the southern region of Malawi. (It was the southern region that was affected in 2015, too). Through funds made available through CAR, the LCCA members affected by the floods will receive some much-needed practical items. Things like buckets for clean water, blankets for warmth, and plastic sheeting for temporary roofing can meet immediate needs. A church building that has collapsed can be rebuilt. Your Africa Missions team would like to encourage anyone whose heart is moved to give a gift to help people in need (due to flooding or other disaster) to please donate to WELS Christian Aid & Relief. And surely I am with you always, to the very end of the age (Matthew 28:20). The Holy Spirit has comforted Christians with these words through the centuries. Whether in times of personal hardship, persecution, or other difficulty, hearing Jesus’ promise to be “with” us gives us peace in God’s abundant love and his plan for us. This peace God gives us is a peace the world needs. Thank you for your partnership with WELS as we work together with Home, World, and Joint Missions to spread the gospel in the U.S. and throughout the world through the new Mission Journeys volunteer program. This program is designed to help congregations and schools prepare and go on short-term mission trips. To learn more about Mission Journeys, visit wels.net/missionjourneys. Does Jesus’ promise to be “with” us apply as we share our faith with other people? Of course. “Always” means all the time and in all circumstances. Will we get nervous? Maybe. What will we say? What if I don’t have all the answers? Jesus says in Luke 12:12, “the Holy Spirit will teach you at that time what you should say.” Read how the Spirit enabled Greta Pagels, a Mission Journeys team member to Ecuador, to step out of her comfort zone. Watch a team member from Rochester, Minn., tell how our Lord impacted her life through a Mission Journeys trip to Escondido, Calif.
Mission Journeys is giving WELS members another way to be a part of the Great Commission. Would you be interested in joining a Mission Journeys team? Would you consider supporting the program through your prayers and gifts? However you participate, we appreciate your partnership. P.S. “Like” WELS Missions on Facebook for more stories and updates on Mission Journeys and WELS mission work around the world. https://wels.net/wp-content/uploads/2019/03/Mission-Journeys-team-to-Escondido-CA-711x400.jpg 400 711 agoede https://wels.net/wp-content/uploads/2013/04/WELS-logo3.png agoede2019-03-26 14:28:522019-04-18 15:19:29"I am with you"
Go and make disciples of all nations, baptizing them in the name of the Father and of the Son and of the Holy Spirit, and teaching them to obey everything I have commanded you (Matthew 28:19). Jesus gives believers the Great Commission to “go” and “teach” the gospel. Thank you for your support of WELS that allows home and world missions to do this. Our new program, Mission Journeys, gives WELS members the opportunity to go on short-term mission trips where they can help a congregation or mission field in their ministry. Watch this video from a Mission Journeys team in Ecuador to follow one church’s Mission Journeys experience. Go to wels.net/missionjourneys to learn whether your church might be able to participate in Mission Journeys. Before the mission team leaves, they go through training materials to prepare for the trip. The most important part of the preparation is time in God’s Word. Paul says in Colossians, “Let the word of Christ dwell in you richly as you teach” (3:16). Before teams “go” and “teach” others, they are spiritually filled up. Mission Journeys training gives teams devotions, prayers, and a focus on personal discipleship. Our prayer is for the Holy Spirit to “teach” each team member through the Word to prepare them for the mission trip. God-willing, the team will have opportunities to “teach” others about Jesus while on their journey. This could be through a vacation Bible school devotion, a personal witness, joyfully serving the community and letting the light of Jesus shine, or any number of other opportunities. The world needs Jesus. The consequences of this message are eternal. Would you be willing to make a gift today to WELS Mission Journeys to “teach” mission teams as they go out and “teach” others? Together, we have a “partnership in the gospel” (Philippians 1:4). P.S. “Like” WELS Missions on Facebook to learn more about Mission Journeys trips and to get exciting updates on current WELS missions throughout the U.S. and world. We heard pounding on the front door at 1 A.M early on a Sunday morning. I stumbled around in the dim light and answered it only to discover a very drunk man who wanted to talk. I was half-asleep, and he was. . . well, you know. The conversation was almost comical. Finally, it became clear to me that he was asking if he could sit down. Given several factors, that was not a good idea, so I asked him if we could talk another time. He tried to show me where he lived but pointed in all four directions and mumbled something about building three. I asked him for his contact information, but he had lost his phone. As I escorted him out, I noticed that he had gotten sick all over the floor of the entryway. I watched him go to the elevator and get in. In the morning, I noticed that he must have come back out of the elevator, took off his jacket, and gotten sick some more. “That’s disgusting,” you say, “Do you really have to share this in a Missions Blog?” Yes, I do. Because some great things happened through this rather unfortunate and disgusting situation. First of all, I learned even more about the beautiful heart of my beautiful wife. Our entryway is public. People walk through there. In fact, our landlord lives just across the hall from us. Without a single complaint, my wife put on her rubber boots and dish gloves and cleaned up the whole mess on her hands and knees. She never said one negative thing about this bozo who scared us half-to-death (imagine getting a knock on the door at 1 A.M. in a country where missionaries are being expelled every day. . .) and then made a disgusting mess all over our hallway. Second, the next day (or I guess I should say that is was much later that same day), the young man returned to apologize. He happened to show up when a Christian brother was also arriving. The young man said he was embarrassed. I told him that we are Christians and that we forgive people. We gave him a Bible. We told him to read the gospel of Mark and send us any questions that he had. He was shocked. We exchanged contact information, and I have had further opportunities to shower him with grace. In the local language, his name could be translated “bright promise.” The night he banged on our door, there wasn’t much “bright promise” to be seen—just a young man making a fool of himself and possibly throwing his life away. But God used it to introduce him to the life-changing gospel of our living God. It turns out that he actually lives 3 floors above us—the exact same door. For some reason, the elevator doors opened on our floor and brought us together. I’d like to think it is for his eternal good, the “bright promise” of heaven. Which side of the clouds are you looking at? As I was flying into a city in East Asia, I spotted this scene out of my seat, 42A. We had been flying above the clouds in bright blue skies with puffy white clouds. But as we descended it got darker and darker. Black clouds cast a pall over the city. . . but then a break in the clouds revealed my destination. There was even a little sun out on parts of the city. Doesn’t this pretty much sum up what it means to see the world as a follower of Jesus? The group of people I was going to visit had been under a dark cloud. Local authorities told them they could not meet in the location they have used for a year and a half. They would be watched. Their lives would be touched by moments of fear and doubt. But when I met to encourage them, I found that the Son was still shining. Brothers and sisters didn’t want to let the fear of persecution split up their group. They did want everyone to be doubly united in faith and hope to carry on. With God’s help, they will! They see the One who is both over the clouds and walks with them under the clouds. It’s not an easy situation, but the early Christian church faced much worse. Persecution in the 21st century has grown to the point where many say Christians worldwide are the most persecuted of any group. Governments that want to control Christianity have more tools than ever such as surveillance cameras and other technology. But God’s eye is always on those who trust in him. His Kingdom will not be brought down. Some brothers and sisters may be getting a small bruise as they stumble on a stone of persecution right now, but no one and no thing can ultimately oppose the Rock of Ages. As Jesus said, “Anyone who falls on this stone will be broken to pieces; anyone on whom it falls will be crushed.” – Matthew 21:44. So let us fear God! May God bless governments with wisdom. May he strengthen his people whose lives are momentarily disrupted by fear. May he help all of us to keep seeking his Kingdom and his righteousness. We can trust his promise that the gates of hell shall not overcome it. Who doesn’t love to be home? Especially when you have a wonderful family such as my parents and older sister. I was born in Malawi, Africa, though I spent the first ten years of my life in the small town of Chipata in Zambia. My father, Pastor John Holtz, worked as a missionary there until he received a call to move to Malawi in 2008. I spent the rest of my school years there all the way until I graduated secondary school at age 18. Since then, I have been attending Wisconsin Lutheran College (WLC) as a nursing student, currently in my third year. I have been extremely blessed to have been able to go back home to Malawi during the longer breaks to see my family and old friends. As part of the nursing program at WLC, third year students go on an immersion trip to Lusaka, Zambia (the capital), where they stay on the seminary grounds. I did not live in Lusaka, but my family traveled there often for work and missionary gatherings. So there I was, surrounded by my classmates in a place so foreign to them yet so familiar to me. It felt odd, simply put. At the same time, it was a huge blessing to be able to share my life in such a unique way with the people who have accepted me into their lives in the United States. The purpose of our trip was to experience the medical field in a Third World country. We visited the government-run hospital known as Chelstone, a private children’s clinic known as Beit Cure, an organization for disabled children known as Special Hope Network, and also some grade schools for teaching. We also traveled to a rural clinic in the town of Mwembezhi where WELS missionaries originally started their work. I thought that all of these organizations were impressive. With limited resources and endless patients, these facilities are doing a great job at providing inexpensive to no-cost care while still providing respectable patient outcomes. You may be wondering if it is my desire to work there . . . that answer is difficult. In Zambia, only local residents are hired. The advanced health care systems in the United States have a much different focus, some of it good, and some of it I do not particularly like. On top of it being hard to “adult”, it is even harder to know where to start when you are pulled in so many different directions, as many missionary kids often experience. So what does it feel like to be back home as an adult missionary kid? Contrarily, going back to Malawi makes me feel like a kid again. Many of my childhood memories were experienced there and in Zambia, my friends are there, my pets, my house . . . but most of all what makes it home is my family. I know its cliché, but how can I deny it? Whenever I am home, I feel myself again, though it is bittersweet. I go back, knowing I’ll have to leave again in a few weeks. I always cherish my time there, though I remember that life on this earth is temporary. Any struggles here on earth are nothing in comparison to the glory that will be experienced in heaven. Something that I find both comforting and amazing is that those same people, that my dad and all the other missionaries and Lutherans in Africa impacted, are going to be with me in heaven someday. I thank God for my life in Africa, and I thank God for my life here too. But most of all, I thank God for saving me a place in his Kingdom. The office is small. I’ve seen closets much larger. Even water closets (WC). The office was a stuffy square cubicle crammed with two desks, two chairs and a filing cabinet. No window. The desks were almost touching each other. Both were an eyelash’s width from the cabinet. A room clearly built for one but forced to accommodate two. The problem? There were four of us. Oops, sorry. Five. Two more chairs were wedged in and two more people squeezed in. We couldn’t really walk in the room, we had to shuffle. There’s more space between a couple slow dancing then there was between us. The fifth person had to stand in the doorway and lean in because the door wouldn’t open all the way because one of us had to sit or stand behind it. Sardines in a tin can. One person spoke ONLY Portuguese, NO Chichewa and NO English. One person spoke NO English, very little Chichewa and Portuguese. One person spoke Portuguese, Chichewa and NO English. Two people spoke Chichewa, English and NO Portuguese. What do you get when you bring five such people together? We all had to understand the two sets of documents in front of us. One set was written ONLY in English, the other ONLY in Portuguese. These weren’t simple stories with pictures for children. They were official documents outlining procedures for a Foreign Religious Confession Registration. Technical lingo. Government garble. Procedures and Requirements. That’s why we were there. The Lutheran Church in Central Africa Malawi Synod (LCCA-MS) would like to register as a Foreign Religious Confession in Mozambique. The Reason? It would like to bring the gospel of Jesus to people across the border. In the past, the LCCA-MS did. The government allowed both the LCCA National Pastors and the WELS Lutheran missionaries to cross the border without many hassles or questions. In fact, they welcomed us when we told them we were planting churches. They stamped our passports and wished us the best. We didn’t have government permission on paper to work with the church in Mozambique but we had their word that “all good” and to us their word was good enough. Consequently, over the years, various Lutheran pastors and missionaries repeatedly crossed the border. They preached the Word and formed congregations. Spiritual farming in action: plowing the soil, planting the seed, watering the sprouts and tending the trees. Enjoying the fruit. The church was growing. The Harvest plentiful. Why do you keep entering Mozambique? With what organization are you working? Lutheran Church, hey? Then where’s your official registration? Uh…uhmmm…well… so….you see….ahhhh….we don’t have one! The Mozambiquan government doesn’t accept oops. As a Lutheran Synod in Malawi we realized it was time to get registered. That was years ago and we’ve been working on it since. The registration road is long and bumpy. So is the road to get to the Religious Affairs office in Lichinga. 160 kilometers of dirt detours, mud runs, water filled ruts and jarring potholes. But it was the only way to get to Lichinga. After a grueling 6 hours to travel 100 miles we ended up Ministry of Religious Affairs huddled over the two documents. Combined, those two documents ultimately meant that we needed to submit ELEVEN documents to make an acceptable application. Some still needed to be written, others rewritten. Two needed official notarization. All of them had to be translated into Portuguese. A despairing thought: could this even be done? We wondered, what was the biggest barrier that was going to be against us? Language? Time? The wheels of government machinery turning ever so slowly? The Ministry of Religious Affairs officials didn’t actually speak those words but we knew that’s really what was being said. Whether in English, Portuguese or Chichewa, it meant the same thing. Then, as it does every time at the beginning of Mission Impossible, the tape recorder self-destructed and went up in smoke. Not really, but out hopes did. In order for us to accomplish the mission it meant numerous trips to the translators, police, internet café, print shop, office supply, Ministry of Religious Affairs . . . then back again and again and again to each of them. We were the ball in the pin ball machine. Bounced from one place to another. Submit an application? It didn’t seem possible. With man some things are just plain impossible. But with God? ALL things are possible! If He can raise the dead and Himself, can’t He raise our hopes? And four days later, squeezed back in the two-man cubby hole, we put the documents into the hands of the Religious Affairs Officials. They analyzed and scrutinized. They looked for any mistake and searched for anything missing. When they turned the last page of the last document, something broke: a smile on their faces! Mine too. They said our documents were all in order. They accepted them. It doesn’t mean they approved the application, but it means the documents are worthy to send on to the head office in Maputo, Mozambique for approval. Or not. What it does mean is that our work is done: the forms are filled, Letters of Honor are written, Criminal report acquired, ID notarized, Religious Biography composed, Constitution translated, First-born sacrificed. Well, we didn’t sacrifice anyone when doing our work, but God did when he was doing His . . . and He accomplished the impossible: He opened the border to heaven! It’s an honor to be traveling that road with you, Mission Partners! While we travel that road together, I have a humble request. May I ask you to pray about this issue? Pray that the government approves our application and grants us the registration so we can continue the Kingdom work we left across the border in Mozambique some years ago. Pray with confidence. Pray with persistence. Pray boldly & daily. Pray in Jesus name and to His glory. Rejoice with us! The amazing has happened already: the documents are in the hands of the Ministry of Religious Affairs in Mozambique. Rejoice with us! The comforting thing is already known: the final outcome is up to God. Everything is . . . and has been all along. Pastor Tsavxwm Ham is 50 years old and serves in Son La province of Vietnam. He comes by motorcycle and bus (a 9-hour trip) to the training seminars in Hanoi. He is the chairman of the Hmong Fellowship Church (HFC). I’ve been a pastor in Kon Tong village since 2006. Before that, I served as an elder in the church from 1996 to 2003. In 2003, I began studying to be a pastor through the Vietnamese Fellowship Church (VFC). I passed that program in 2006 and became a pastor. In 2007, I was appointed as Chairman of the Hmong Fellowship Church. My story of how I became a Christian is important to me. Before I became a Christian, I was one of the men in my village who was educated in the Hmong traditions and customs. I was also the director for Hmong funerals and a funeral musician. During that time, I felt very sad. I wanted to help the people. They would always give me a lot of meat when I would do a funeral for them. They treated me very well – and I really wanted to help them. But I had nothing to help them with. The funeral could only leave them sad and empty. At that time, I also worked as a Shaman and a fortune teller for the people. In my heart, I knew that all of this was wrong and a lie, and I couldn’t keep on deceiving my people by acting as a fortune teller and a Shaman. All of this time, instead of helping the poor families, I took money from them as the Shaman. I felt very bad about that. I thought about how I could change my life and do something to help the community. Around that same time, I heard a pastor preaching through a radio broadcast. A village near me had already become Christian, so I contacted the leaders from that village to get materials from them. Through the radio broadcast and the Christian materials, I also became a Christian and left my former life behind. One year after I became a Christian, in 1997, I was arrested and tortured by the local government. The persecution of Christians was heavy at that time. Since I was appointed as the Chief of my village, I had some authority to be able to defend my faith and the new faith of my village against the persecution. But the attack against our faith was very harsh. In 1998, I was recommended by the local government to receive special training – ‘re-educating’ me because of my faith. The goal of this training was that I would renounce my Christian faith. But at the beginning of the training, they talked about what Christians believe about God and creation. It was meant to show me the foolishness of Christianity, but it motivated me to learn even more about God and the creation of the world. And when I came back from the training, I was even more motivated to serve my congregation. After I returned from the seminar, the local government sent officers to follow me to my village. They ask me to renounce my faith. I said I would not. The officials told me that I must – and I told them, “you taught me to have more faith in God because your introduction of the seminar talked about God.” I confronted them because they were saying that I needed a license to have a church. But they hadn’t had a license to carry out the education seminar. So I told them that I didn’t need a license to serve a church in this area either. In the end, they couldn’t get me to renounce my faith and they went home. So they sent the Hmong officer to talk to me. I asked him the same question. He explained that this was not from the central government, but that these rules were added for the local government. I pushed on. “If it isn’t from the central government, how can you arrest me?” After a time, they delivered their response: We will not do anything to you, we will let you go home. Just don’t spread the news that we persecuted your family. They sent another three soldiers to watch me for three weeks. They wanted to make sure I don’t cause any problem for the government. After this time, I met with the first believer in my area. I asked him to come to Hanoi with me. We would go to talk to the Christian Mission Alliance (CMA) church. We went and met with the president, but he didn’t help us. He just sent us back and said all sorts of bad things about the Hmong people. We were so disappointed. I was so angry. I resigned from my post as the chief of the village, and traveled by foot for three days through the jungle villages around my home to try to help out Christians who were being persecuted by the government and to try to get them released from prison. All the while, I tried to convince the local government officials that the persecution didn’t come from the central government, but from local government. I took members from the churches into the jungle and we talked in secret about our faith. We talked about what the best way would be to avoid persecution. We wanted to make sure that we were able to have a good foundation for the Christians in the Hmong community. At one point, we went back to the CMA again, but they wouldn’t protect us – and they wouldn’t provide us with anything. They only gave us a few Bibles and sent us back home. The warned us not to say that we received the Bibles from the CMA. So, we went home, and I continued to meet with my members and the other Christians in our area. And we would pray together. Another time when we were being persecuted and Christians were being arrested, I tried to debate with the officers. I told them, “Since I was 15, I was an officer in the government.” They sent a top general to come and talk to me. His goal was to convince me to recant my faith. He told me, “If any war comes to this country, it will come from the Christians.” But I said, ‘Christians won’t bring war. But if you will bring war against the church, that is your choice. We won’t deny our faith. If you want, I will call together all of the Christians in our province – and you can kill us all. But we won’t wage war.” I continued, “We have fought for this country. Their families have shed blood to protect this country.” The general sat silently. “I’ve never seen anyone speak as boldly as you,” he said. I continued, “You aren’t here to protect the people, but accuse them of wrongdoings – things that they aren’t doing.” I told them that if they didn’t stop persecuting us I would write down all of their names and would go directly to the United States Embassy and submit their names. I remember – the general got so mad. He threw his documents in my face. But in the end, the general just left. They sent word: “We apologize, and we will leave you.” Since then, the persecution in my area has reduced. That was the local government at that time – but at this time the government has changed and there is very little persecution in our region. Even though our region was one of the most persecuted in all of Vietnam, the Christians multiplied quickly. We worked hard to spread the gospel. I also ran a clinic in my house. Whenever we would admit sick people into our house, we would give them the gospel. In 2004, I heard that the Vietnamese Fellowship Church (VFC) was welcoming churches into their fellowship. So I called the VFC to see if we could be part of that. At that time, I started to receive some theological training from them. In 2007 they appointed me to oversee 16 districts and the towns in them in my area. Then, in 2010, they appointed a few more pastors to help me oversee those congregations and then they called me to oversee all the congregations in the Songla province. In 2012, we were invited to the VFC’s annual meeting in Hochimin. There I was called to be the chairman of the HFC. Currently, in the HFC, we have 240 senior pastors and 330 additional pastors. Many of our churches don’t have pastors and are served by local elders who have been appointed. In total, we have more than 100,000 members. In the congregation that I pastor, we have 58 families that are members. Some of the people who come to worship with us aren’t members yet. In total, we have an average of 380 in attendance every week. In addition to serving the local congregation, I also personally oversee 30 pastors and around 18,000 members in my area. Our goal is to continue to share the gospel with the families and villages around our church and in our district who don’t yet know Christ. We have some goals for our congregation – our current church building and location is too small to provide for the growing church. We hope to build another church building on the hill in the village – a bigger church so we can have more people come to worship. We also hope to build a small park in the area around the church to attract tourists from other villages to our town and provide an opportunity for our members to do outreach to them. The training we are receiving is key – the leaders and members in my church need more training in the word of God so that they are well equipped. We want to train leaders in our church to spread the gospel to the surrounding villages. When we receive the training from WELS in Hanoi, we take it back and train the local leaders with what we have received. The pastors in my area have received training from a variety of churches in the past – the Vietnamese churches, Korean missionaries, and even Hmong pastors who have come from the United States. But each of these groups and individuals came and did the training based on what they wanted to accomplish. And all we learned were rules to follow, good works that must be done, and how to live good lives to please God. We would go to training from these churches, but among our churches, there was no stability, no peace, and no gospel. We had no unity among our churches because we all just interpreted the Bible based on our own ideas or the various things we had learned. That all started to change in 2013 when Pastor Lor started doing training for us in Hanoi. Now we have both physical and spiritual unity. The Lutheran doctrine has brought peace and harmony to the people in the villages – and as a result, our members are sharing their faith and our churches are multiplying. Personally, since I have been receiving training from the WELS, I see a change in myself as well. Before this, I taught and used my own authority in the church. At that time, I thought, “I’m the smart one – I’m the one with training, and I am the one with the authority. I can force my members to do the right thing.” But since I have been studying with the Lutheran Church, I have changed. I have reevaluated myself and how I taught in the past – and know that I have taught false teachings. The training made me value my members more – and know that they need the gospel. I used to use the law to motivate my members. That was how I showed my authority. But since receiving this training, I now understand that the law won’t help the members. I started to share the gospel and taught them to understand that the gospel will motivate you to love and show care for each other. What I have noticed is that now my members respect me even more than they ever did when I only used the law, rules, and traditions to lead them. On May 29th, 2018, I gathered together 129 local church leaders at my congregation. I retrained them in Lutheran theology as we have learned it from WELS. I assured them and demonstrated to them that this teaching was the true Biblical teaching. After that training, they encouraged me to keep on receiving training so that in the future the local leaders can continue to receive training from me. It is their dream that they can all receive formal training as well. At that meeting, I also invited local government officers to attend. When I finished the training, they applauded my teaching. The head officer said that this was one of the best teachings that they had ever heard. They encouraged me to continue my training and bring it back to the villages so that the people can continue to learn the Bible and grow in their understanding. We’re not done yet. We need more training – for this generation and the next generations of pastors. I’m 50 years old right now – I hope we can continue to partner in training until I am 60 or even 80 – until we can carry on this ministry by ourselves and be confident to train our own pastors and leaders. The HFC is scattered across 14 provinces of Vietnam. It is our goal as HFC to be the ‘big brother’ and standard for solid Christian Hmong churches in all of Vietnam. Finally, I don’t have anything to send to my WELS brothers and sisters in the U.S. to even begin to show our gratitude or appreciation. All we can send is our ‘empty’ words of Thank You to you. But we are thankful. We trust that in the future the training will continue to equip leaders so that the gospel will spread to many more throughout Vietnam. Pray for us. Pray for our religious freedom in this country, especially for the Hmong in the rural areas. And pray that the many minority people will have the opportunity to hear the gospel and believe it. Pastor Vang is 36 years old. He serves in Lao Cai province as pastor of Shan Zhou Fu congregation. He travels an hour by motorcycle and 4-5 hours by bus to get to the training in Hanoi. When I was 8 years old, my parents became Christian. That was in 1990. I became a Christian when my parents shared the Good News with me. In the early years, some of my brothers came to Hanoi and received training from the Christian Mission Alliance (CMA) church – our congregation was established by the CMA and was under them at that time. That was around 1991-1993. In 1998-1999, I served as the secretary for the congregation and began to serve in the church. In 2001 and 2002, the persecution from the local government became intense against the churches in our area. As a result, we divided our church into smaller congregations and worshiped inside houses. At that time, we reached out to the CMA for assistance, but they did nothing to help. From then on, we didn’t have any connection with the CMA. In 2003, our pastor contacted the Vietnamese Fellowship Church (VFC), and in 2004 we registered our congregation under the VFC. I received training from the VFC from 2004 to 2006. Then in 2006, I was called by the church to be a pastor. At that time, I was still unclear about so many things in the Bible. Looking back, I see that while we talked about Jesus as our Savior, we didn’t understand law and gospel and we promoted a lot of work righteousness. That was the church that I had grown up with – if you don’t do good, or live according to the rules, you don’t count as a Christian. We always had a lot of legalism in the church. The pastors promoted many traditions to control the members. There are currently 140 members in my local congregation. I also oversee 12 additional congregations in three different districts of Lao Cai. Those churches have a total of 1400 members. Those 12 congregations are led by elders – I am the only pastor. In our whole province, there are only 12 pastors, but we have a total of 65 congregations and more than 9,000 members. All of us pastors are so very thankful for the training – and for WELS opening the door for us to receive this training. Every time I go back home, I conduct a training session for the elders that I oversee. Every time we focus on law and gospel and how to interpret the Bible. Even though I have received much training ever since 2003, I was always really confused by the training. I didn’t understand the scripture well. Since 2015, I started to receive training from the pastors here – Lutheran training. This opened my eyes. The first year, I was still trying to understand it all, but since 2016, I see the message is really clear. This made me really happy and now I enjoy my studies. I really enjoy our training here. We see Christ at the center of the Bible and the center of everything that is taught. We truly believe that salvation comes through faith alone, through Christ alone, through Scripture alone. This foundation has made me confident as a Christian and confident in my salvation. This training has changed me a lot as a pastor as well. Before the training I just preached the law – I treated people with contempt. If I saw a member committing sin, I hated them. If they had addictions, I hated them. Now, as I look back, I see that I was a Pharisee at that time. Now, I hate that time of my life. But since I received the training from Pastor Lor and Professor Bare and the other pastors, I have learned to show compassion to the sinner. I have learned to show Christ to the sinner. Thanks be to God – thanks to all the professors and teachers who have come to teach. One thing I am certain of – the students coming are now certain of their salvation in Jesus Christ. They are confident that Jesus did everything for them. This is a special thing. And this is something they didn’t have before. Before the training, so many others were just like me. My members were also just like me. But now we have compassion and love. And now we have joy. The Hmong Fellowship Church (HFC) is a very big church body. We have more than 340 pastors and more than 100,000 members. It is my dream that WELS and the HFC can hold hands together to do the ministry for the people in this country. I want to see the training continue – not only for myself – but for many people, for the younger generation. We will need much more training in the future. In my local congregations, we need more evangelists so we can send them to the villages around us and other places where people have not heard or believed in Jesus. I pray for the training – that through this training our pastors can be united in the same faith and the same doctrine. And I pray that this training will continue into the future. That’s what I pray for. I also pray that in the future we will have our own facility for us to go and receive full-time training. I also ask for you to pray for me and my family. I pray one day that I will be able to reduce my farming work so that I can have more time to do the ministry of leading the church. Finally, I want to thank the Lutheran church for supporting the training. We don’t actually deserve to receive anything from the WELS – but they just give and support the training by sending professors and providing the financial ability for the training to take place. For that – I thank you. Thank you so much. I will never forget you. You helped us to see the Word of God clearly. You have brought us the truth – and that has changed our lives. Over 1,200 attended the Apache 125th anniversary celebration at Peridot Lutheran church and school, Peridot, Ariz., Oct. 26–28. The event commemorated the 125th anniversary of WELS World Missions work in the Apache reservations of Arizona. Since its humble beginnings in 1893, the Apache ministry has grown, now serving over 3,600 people in a variety of ways. Five missionaries, two Apache pastors, and one Apache evangelist serve the nine congregations on the reservations. 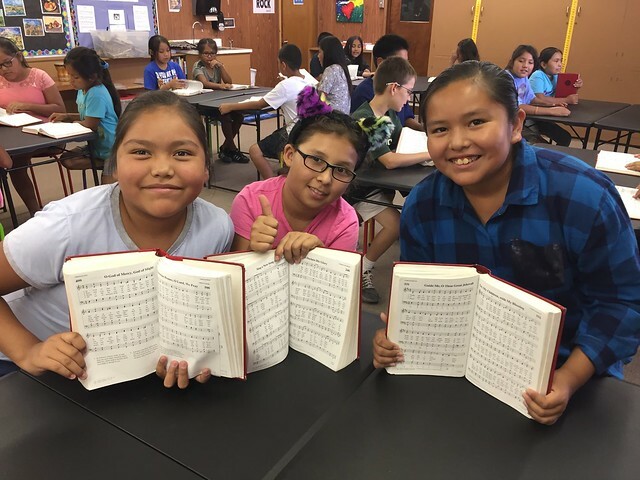 The Apache Christian Training School (ACTS) provides education and resources to prepare leaders for sharing God’s Word on the reservations and beyond. Two schools serve over 275 students, giving them a foundational Christian education. These are just a few of the services for which attendees gave thanks at the celebration last month. To begin the celebration, visitors spent Fri., Oct. 26, touring the San Carlos and White Mountain Apache reservations, admiring the nine WELS churches. This included Peridot Lutheran church and school, where the first missionaries, John Plocher and George Adascheck, began to share the gospel message of Jesus Christ among the Apache people. On Saturday, Rev. Gary Lupe, Gethsemane, Cibecue, Ariz., hosted visitors in Peridot as they enjoyed traditional Apache food and crafts. Rev. Dr. William Kessel and Rev. Eric Hartzell gave two historical presentations. Photos and artifacts from across the mission’s 125-year history were displayed along with information about future outreach plans for Native Christians. A special worship service followed that evening at San Carlos High School. Choirs from the reservations’ churches led the visitors in worship. WELS President Rev. Mark Schroeder gave the service’s closing lesson. On Sunday, all of the reservations’ congregations joined together to hold seven “Rally Day” worship services. Learn more about the Apache mission and its work at nativechristians.org. Download Bible studies related to Rev. Dr. William Kessel’s presentation. Originally appears in the October 31, 2018 One Africa Team blog. Next July (2019), our Nigerian Mission Fields will re-start their joint Seminary program. This time we will work with 22 men who desire to become part of the full time called worker core that we have there. Christ the King Lutheran Church of Nigeria (in Akwa Ibom State) hopes to more than double their ministerium of 9 pastors, bring 10 more to start the seminary program. All Saints Lutheran Church of Nigeria is also hoping to make a sizable jump from 11 current pastors to add 12 more to the program. Christ the King Board of Governors meets in the “outgoing” classroom at Uruk Uso – discussing needed changes. It’s the biggest class we’ve had in many years, maybe ever. Big enough to push some WELS donors to put financial resources together to pay for a new dormitory building and some refurbishing of the current classroom building to accommodate everybody. Understand what I mean by “dormitory” (the new building) – in an effort to keep it simple (= inexpensive), we will have one large room with beds, dressers, and a small desk for each student. With no walls between the “rooms” – the students will get to know each other very well! This will keep our Board of Governors very busy. To make things even more interesting, that same Board of Governors, hand-in-hand with the Seminary director, has requested some revision to the seminary curriculum including an increase of classroom time by over 30%. There is a lot of work to be done in the next 8 months from digging a foundation, putting up walls and a roof, beds as well as decisions about who will teach and what books they will use – your prayers are essential to this process! Our two sister church bodies in Nigeria currently have a combined membership of over 3,900 members that worship in 57 congregations. Five centuries after Luther’s Reformation the message of God’s salvation by grace alone, through faith alone continues to produce a rich harvest of souls all over the world. God has graciously answered our prayers for more workers in Nigeria. May the Lord continue to shower his grace on our Nigerian brothers and sisters in Christ through a new generation of pastors who serve his people faithfully! Written by Kathy (nee Uhlhorn) Felgenhauer, whose husband Stefan is the new Director of Africa Missions Operations for the One Africa Team. My husband and I visited the continent of Africa for the very first time 20 years ago. Four years later, we moved here for our first tour of duty. Most of the missionary families currently living in Africa have lived here for more than two decades. They hardly consider their overseas service as “foreign” anymore. Their lives tell the story of WELS mission work in Africa. Our family has a unique perspective. We have transitioned back and forth between North American culture and African culture several times. We have a well-rounded view of both developed countries and developing countries. The readjustments we’ve made have been a trial, but they have also give us valuable insight into both worlds. So now we’ve been here in Zambia for just over a week. What are we thinking? What are we feeling? And how is the adjustment going this time? First impressions can be useful tools. Stefan and I find it interesting that in our time of moving between cultures, we have short-lived first impressions upon returning to a place we used to live. It’s fascinating to take note of those first impressions, before our previous experience takes over and we settle into our routine once again. I keenly remember my first impressions when we moved to Africa the second time. Even though we had lived six years in Africa and still had keen memories of that time stuck in our minds, we had forgotten about the challenges of day-to-day living in a developing country. Anna (age 12 – born in Malawi): I was looking forward to seeing the Seminary campus because we never lived close to any of those before. It’s different than I thought, but I was amazed at how big it was and happy to see the kids there. I can’t wait to get my bike so I can ride it there. A lot of things seem the same, like the gates on doors and the geckos and skinks on the walls, but I forgot how hot it is. I’m looking forward to visiting Malawi and seeing some of my friends. It’s fun to order Fanta at restaurants again and hopefully soon we can go swimming somewhere. Benjamin (age 14 – born in Malawi, will return to the USA for school in 10 months): Africa is like I remember it, but Zambia is a bit more modern (than Malawi) with a lot more shopping centers. I was looking forward to being outside and barefoot, and I am doing that again. It’s really dusty though. Being in Africa feels like being back home. It’s kinda hard getting used to slower Internet. I look forward to finding soft drinks in glass bottles like I remember and visiting game parks to see the animals. It seems weird to think that the next 10 months will be the longest amount of time I spend here. Louisa (age 16 – born in Germany, attending high school stateside): I am loving all the photos they’ve sent mostly of foods I remember, such as Blackcat peanut butter and Parmalat yogurt and the mango juice. I was happy to see some jacaranda flowers. Finding time to facetime my family when it is still daylight so I can see outside has been tricky with a 7-hour time difference, and I can’t talk to them during my evening because they are sleeping. I can’t wait to visit at Christmas. Kathy (not as young as I once was – born in the USA): As the plane was descending I saw purple jacaranda trees, and exiting the plane we saw bright flame trees. That alone put a smile on my face. Climbing into a car for the first time again was an odd feeling, sitting in the passenger seat on the left. It actually made me feel a bit dizzy, and I’m a bit nervous about driving again with the deep ditches on the sides of the roads. I had forgotten how dry and red the earth looks this time of year. The streets seemed less congested on our drive, but the style of the house we are currently staying in was so familiar. Tiled floors throughout, locked gates on doors, a limited water supply in the reserve tanks, and candles at the ready for the electricity outages. “I know how to do this”, I told myself. The trill and song of the birds that first morning was unbelievable. I knew I had been missing it. It is a new place with much that is familiar. I long to settle into our life, getting our own kitchen items, our own bed, and our own daily routine. That’s going to take quite some time yet. It’s already been 5 months of transition since Stefan was hired, and it could be several more. I am praying for patience. I keep checking the time to see what Louisa must be doing back in the US. I am so thankful for the technology that lets us keep in touch. Stefan (a little more grey – born in East Germany): I’m so happy to be back in a warm climate again. I did forget how warm it is this time of year and how dusty everything gets. I knew I was back in Africa when we stepped off the plane, and I had to walk quite a ways on foot to get into the airport. The wait to get through immigration tested my German patience. The woodsmoke-filled air is strong too, but I do know the rains are coming and that will bring relief. I am enjoying the African scenery, and it makes me excited to explore and learn this new area. Visiting the other countries where One Africa Team is active is a priority for me and one I look forward to. In some ways Zambia is more modern than I would have thought, but the Internet is still slower than I got used to in the US. Overall, I am thankful for the opportunity to be here and to serve the Lord in this way. It’s the work I love to do. It’s good to be back. The Felgenhauers lived in Malawi from 2002-2008 and from 2012-2015 and are currently based in Lusaka, Zambia.